You’ll still find the Depot example at the front, but you’ll also find testing knitted right in. Gone are the long reference chapters — that’s what the web does best. Instead you’ll find more targeted information on all the aspects of Rails that you’ll need to be a successful Web developer. Rails 3.1 introduces a many user-facing changes, and this e-book release has been updated to match all the latest changes and new best practices. This includes full support for Ruby 1.9.2 hash syntax; incorporation of the new Sprockets 2.0 Asset Pipeline, including SCSS and CoffeeScript; jQuery now being the default; reversible migrations; JSON response support; Rack::Cache, and much more. 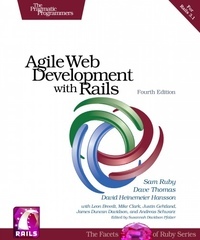 Please note the Rails 3.1 updates are included in both ebook and paperbacks sold directly by us. If you purchase the paperback elsewhere, it may or may not contain the 3.1 updates (2nd printing) depending on their inventory. Check with the vendor before purchasing. Or just buy it here.